Despite all of Microsoft’s “encouragement” to get people to switch to Windows 10 and use Edge as their default browser, Google Chrome is still the top choice on the desktop. Now Microsoft is hoping to convince people to switch to Edge using a different tactic: performance metrics. In a recent blog post, Microsoft illustrated three different measurements to show that Edge is a power-saving demon. In the most convincing display, Microsoft took four Surface Book laptops in default configuration with each running one of four browsers (Chrome, Edge, Firefox, or Opera). It then set each laptop to run the same streaming video on an endless loop and filmed the four laptops to see when each one powered down. 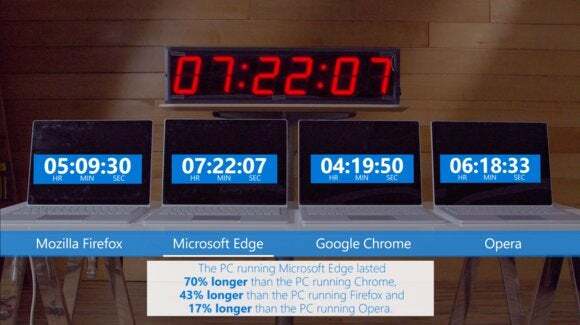 In the end, Microsoft’s demonstration showed Edge lasting seven hours and twenty-two minutes. That was 70 percent longer than Chrome, 43 percent longer than Firefox, and 17 percent longer than Opera in Microsoft’s tests. Microsoft’s lab-based power consumption test results. In another test, Microsoft took a Surface Book into the lab and measured power consumption during a set of automated browsing activities for each browser on popular sites like Facebook, Google, YouTube, Amazon, Wikipedia, and so on. Edge had the lowest power consumption by far in that test, followed by Chrome, Opera in battery saver mode, and Firefox. Microsoft’s browser power consumption telemetry for Windows 10—minus Opera. Finally, Microsoft took a look at its own real-world usage telemetry from Windows 10 users worldwide. 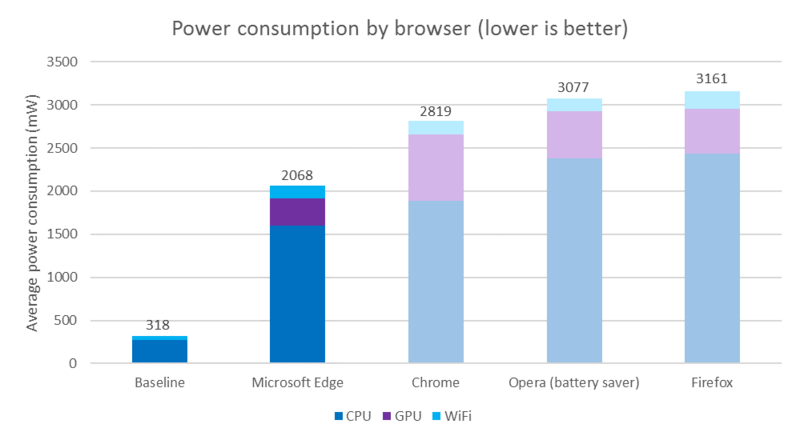 That result also showed Edge offering lower power consumption than Chrome and Firefox—Opera was curiously omitted from this result. The story behind the story: It’s hard to trust data from company tests conducted on the same company's hardware that makes that company's software look better than its competitors. 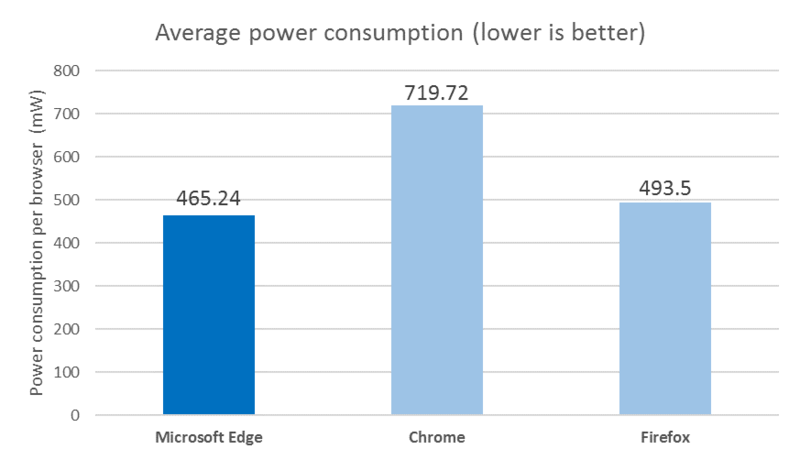 Nevertheless, it wouldn’t be surprising if Edge has lower power consumption than Chrome or Firefox. Chrome in particular is a memory hog as we demonstrated in our own browser showdown last August. The problem is there’s much more to using a browser than pure power efficiency. Last year, we called Chrome the best browser compared to the same ones Microsoft used in its tests. Chrome didn’t win because of its metrics: it won because it had the better overall experience, by far. As we said in our browser round-up, Chrome won because it’s stable; it has a healthy extension and app ecosystem; its interface is not complex; and it integrates nicely with other Google services, from Gmail to synced open tabs that you can access across your devices. Contrast that with Edge, which is only gaining extension capability in July when the Anniversary Update is expected to roll out. Even then it still won’t have synced tabs to help you move between Windows 10 PCs, tablets, and (for all five of you out there—six if you count me, too) a Windows 10 Mobile device. That’s not to say Edge is terrible. It does have some nice features like Cortana integration and web notes. But those are frills. The basics aren’t there yet, which is why Edge comes across as half-baked. No amount of battery saving improvements can change that.